I had an idea recently while devouring a tub of Ben & Jerry's Vermonster ice cream that the flavour combination of the ice cream would be amazing in the form of a cupcake. 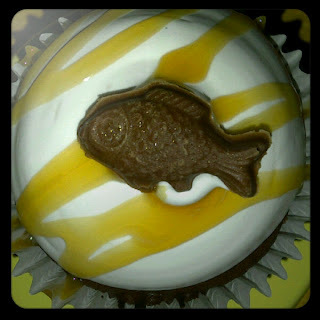 This got me thinking about other flavour of ice cream that could be easily translated into cupcakes.﻿ One popular suggestion was Phish Food: chocolate ice cream, marshmallow and caramel swirls with chocolate shaped fishes. 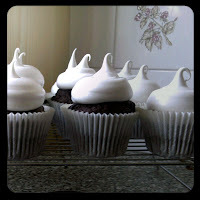 After I got a chocolate mould on eBay in the shape of fishes and researched a recipe for marshmallow frosting I was off! 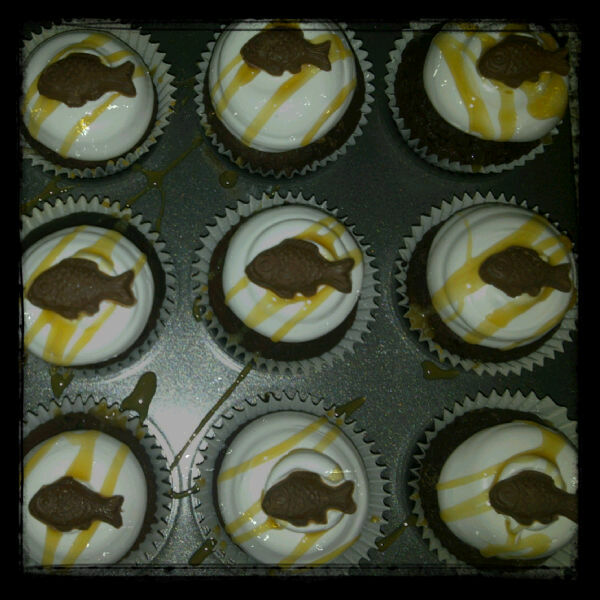 The cupcake would be made up of a chocolate cupcake, marshmallow frosting, drizzled with caramel sauce and topped with a chocolate fish. Cute, right? So I baked a batch of chocolate cupcakes and made some of the marshmallow frosting. Place egg whites, sugar and cream of tartar into a glass bowl and set over a saucepan of simmering water. Whisk constantly until sugar has dissolved and egg whites are warm to the touch (approximately 3-4 minutes). Transfer to a larger bowl and whisk with electric mixer. Start on a low speed and gradually increase to high until stiff and glossy peaks are formed (approximately 5-7 minutes). Add the vanilla extract and mix until it is combined. Use immediately. The recipe says for 2 dozen, but I easily had enough to do 4 dozen. To pipe it onto my cupcakes I used a large round tip, then drizzled some caramel sauce over the top. I just bought mine in the supermarket, but if you have a recipe homemade is always better. This was topped with one of my little chocolate fishies. 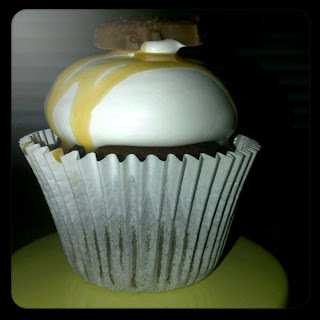 After tasting the cupcake I decided that the next time I make them I think I'm going to do a caramel filling rather than drizzled on top, the caramel flavour a bit lost in the mix. They were still pretty darn good! The marshmallow frosting is so light and sticky (I ended up with it all over my face!) and I imagine it would only be better toasted with a kitchen blowtorch. Oh how I would love one of those to play with! Anyways, here are a couple of close ups of the cupcake. Hope you enjoy making these! They're pretty fun little cupcakes.